Trains police officers and develops and distributes procedures and best practice guides for law enforcement agencies. 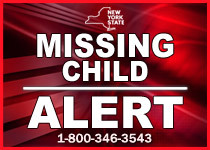 Missing Child Alert: Activated when a child younger than 21 is missing and believed to be in danger due to special circumstances, such as a cognitive impairment or medical condition, that place them at serious risk of harm or death. 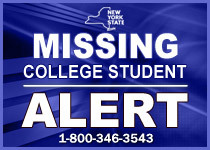 Missing College Student Alert: Activated when a college student of any age is missing and is deemed to be at credible risk of harm or death. Missing Vulnerable Adult Alert: Activated when an individual who is 18 or older; has a cognitive disorder, brain injury or mental disability; is reported missing; and is at credible risk of harm. This includes individuals with autism, dementia or Alzheimer’s disease. Alerts are only activated at the request of police agencies. Family members should contact their local agency as soon as their loved one goes missing. Information about the person is distributed to police agencies, the media, Thruway highway signs, plazas and toll barriers, Department of Transportation highway signs, airports, bus terminals, train stations, hospitals and other locations. Details are displayed on highway signs for up to eight hours. Information is shared via Facebook (www.facebook.com/nyspublicsafety), Twitter (@NYSPublicSafety) and online (www.criminaljustice.ny.gov). NYAlert subscribers are notiﬁed immediately. 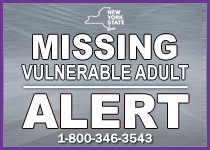 Visit www.nyalert.gov or call (888) 697-6972 to subscribe. How long do alerts remain active? Alerts can remain active for up to 72 hours. If the individual remains missing after that three-day period, case details are posted to www.criminaljustice.ny.gov/missing. How do these alerts differ from AMBER Alerts?